PINEALON - is a natural bioregulator containing active peptide complex. 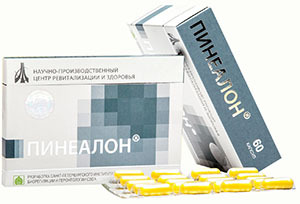 It is developed to recover the brain and to treat poor memory, attention difficulties, brain injury, stroke, high stress, chronic fatigue, depression, insomnia, irritability, Alzheimer's, Parkinson's diseases, multiple sclerosis, as well as to maintain the functional status of the brain in elderly patients. Pinealon contains amino acids that integrate into the DNA structure of the brain, thus reducing their peptide deficiency and restoring protein synthesis inside their cells. Pinealon® is a synthesized peptide complex extracted from the brain of young animals. It consists of the most active short peptide chain and includes only 3 amino acids (arginine, glutamic acid, aspartic acid). Pinealon’s amino acids are transmitted to the tissues of the brain and act directly on the DNA structure. They integrate into the DNA or replace old or damaged molecules in the DNA structure, thus restoring the protein that keeps the cells together. Restored DNA structure provides normal functionality of the brain. Pinealon is recommended for the initial stages of peptide therapy, as well as for short courses of premature aging prevention. Active substance: peptide complex AC-5 (arginine, glutamic acid, aspartic acid). Recommendations for use for adults: 1-2 capsules 1-2 times/day, 30 minutes before meals. Duration: 1 month. Repeat every 4-6 months. Ask us any questions about Pinealon.